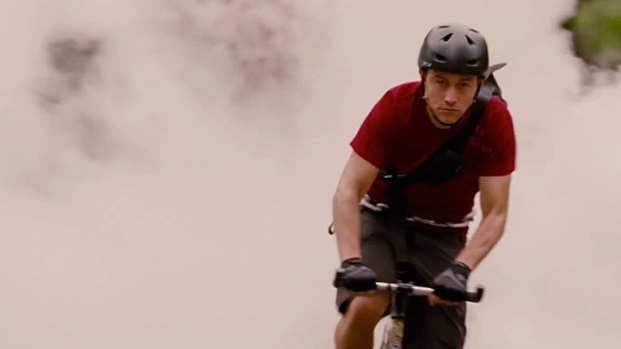 Joseph Gordon-Levitt's Scar-Turn in "Premium Rush"
The actor needed 31 stitches following an accident while filming. In the frenetic thriller "Premium Rush," actors Joseph Gordon-Levitt ("Dark Knight Rises," "Inception") and Dania Ramirez ("Entourage," "American Reunion") play a pair of New York City bicycle couriers who inadvertently wind up having to pedal for their lives in a deadly game of chase. Written and directed by David Koepp ("Snow White and the Huntsman," "Angels & Demons"), the story unfolds on city streets as Wilee (Gordon-Levitt) and Vanessa (Ramirez) hustle to deliver a mysterious package that's come to the attention of a crooked NYC cop (Michael Shannon) who'll stop at nothing to get his hands on it. Ramirez, 32, and Gordon-Levitt, 31, sat down to chat about the intense preparation involved, the quirks of shooting in America's busiest city and how Gordon-Levitt will always have a physical reminder of his role. The riding sequences are pretty intense. How much training did they give you? Joseph Gordon-Levitt stars as a bike messenger racing through New York City with a package that a dirty cop, played by Michael Shannon, desperately wants. Opens Aug. 24. Gordon-Levitt: We had about six weeks. Ramirez: They were pretty good about the training. Especially because we had time after we were cast in the roles to train, before shooting began. We had six weeks of training then we had training in New York throughout the filming. We were in pretty good shape. How long did you have to film in NYC? Was anything shot in the studio? Gordon-Levitt: None at all. We shot everything in New York City. Ramirez: That was a charming part of the film is that we were going to get to go to New York and ride bikes all throughout the summer. How hectic was it shooting on location like that? Gordon-Levitt: It’s intense and people don’t want to be told that they are not allowed to cross the street. Ramirez: We would do a take and there was no way to really shut down major New York streets. They would shut down one lane but always keep a lane open. So we were often weaving in and out of real traffic. Did you have to go back and do a lot of re-recording because of the street noise? Gordon-Levitt: There was some. But that’s part of the reality of these characters. They’d be speaking loudly, yelling even, in real life so we did that. And that made it a lot easier for the sound department. Any run-ins with New York locals? Ramirez: This guy headbutted one of our production assistants! I think the New York Post even wrote about it at the time. Did it feel dangerous to be on the bike and filming on the street? Gordon-Levitt: Well, every precaution was taken as much as they could. Everyone was very safety conscious. I wouldn’t claim it was dangerous the way that some people really do have dangerous jobs – like police officers and soldiers. But you did have four stunt doubles. Gordon-Levitt: Four stunt doubles, yes. Ramirez: I had three I think. There was always one other Vanessa on set, but my stunts were not as dangerous as some of yours. But we definitely had people there to step in for the really dangerous parts of the movie. You have to pay attention. I think that’s the bottom line. To become these characters you really had to take it on and not just be an actor on a bike saying your lines. Gordon-Levitt: I think for what I was doing, the danger was certainly minimized. I was riding fast and riding hard all day long, but what my doubles were doing was so dangerous. Absolutely 100 percent dangerous. That’s part of the appeal of this movie. When you watch action sequences that are fake or computer generated - basically what amounts to cartoons - there’s a big difference between that and watching a human being really risk their life. It’s just exhilarating. Take it back to vaudeville or Evil Knievel or whatever – it’s exhilarating. And that’s the foundation of the action in this movie. The more self-assured you both became on the bikes were you tempted to do more of your own stunts? Ramirez: I certainly fought to try to do as much as I could on the bike. There were certain things, obviously, that I couldn’t do. There’s a huge fall that I take where my bike goes up in the air and I go up the air. There was no way that I could do that. I’m an actress. That was my stunt double Asia. I bow down to her. Gordon-Levitt: There’s always a temptation. And you see it all the time, especially with actors. The testosterone kicks in and they think, “I can do that!” Especially in actors who maybe haven’t been in as many movies, but I am guilty of it, too. It’s not the right move. I did a movie with Bruce Willis, “Looper,” and you’ve never seen someone so safety conscious doing an action sequence. And ["Dark Knight Rises" director] Christopher Nolan is like that, as well. Both extremely safety conscious. I was also a bit more bull-headed until I got hurt. Gordon-Levitt: I got in an accident and needed 31 stitches during shooting. On my arm. So you’re going to carry a scar from this movie forever? Gordon-Levitt: Yep. There it is. [Points to scar on right forearm]. Did that accident prompt the bandage you sport in the movie? Gordon-Levitt: Yes. That scene at the end of the movie was shot the morning after I had this stitched up. That bandage is actually there to cover a huge gash on my arm. So we stuck with it and incorporated it into the movie. You got away scar free, Dania? Ramirez: Compared to 31 stitches, sure! I fell off my bike on a regular basis. I kind of got used to it. I’d come home everyday and be, “Okay, so I fell off my bike again today.” And there is no learning how to fall properly because your feet are in cages and you’re one with the bike. So if you are going over the bike is going to fall on you. 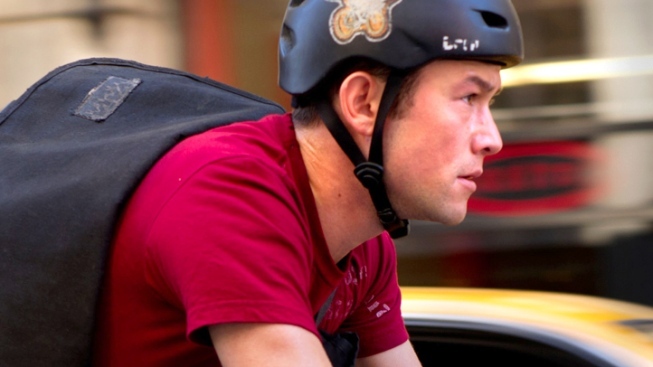 "Premium Rush" opens in theaters on August 24.